Start 2018 with goals you can keep! Start the year with a DETOX. Whether you want to tone up, lose a dress size, remove toxins from your body or just feel better. Build healthy habits that you can use all year round. Purchase and follow the TruHealth Fat-Loss program (TruPLENISH, TruPURE and TruSHAPE) at mannatech.com. 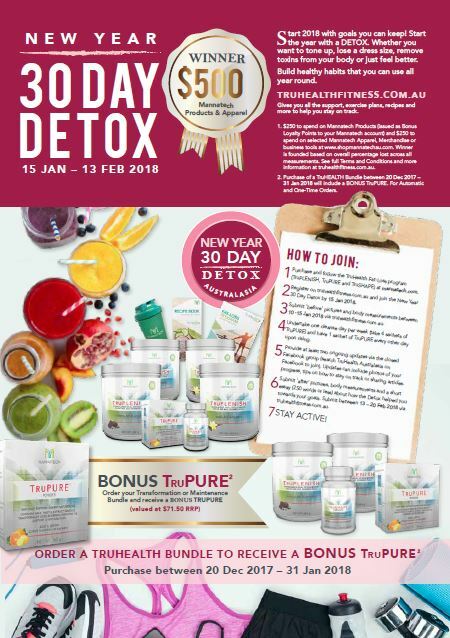 Register on truhealthfitness.com.au and join the New Year 30 Day Detox by 15 Jan 2018. Submit ‘before’ pictures and body measurements between 10 -15 Jan 2018 via truhealthfitness.com.au. Undertake one cleanse day per week (take 4 sachets of TruPURE) and have 1 sachet of TruPURE every other day upon rising. Provide at least two ongoing updates via the closed Facebook group (search TruHealth Australasia on Facebook to join). Updates can include photos of your progress, tips on how to stay on track or sharing articles. Submit ‘after’ pictures, body measurements and a short essay (250 words or less) about how the Detox helped you towards your goals. Submit between 13 – 20 Feb 2018 via truhealthfitness.com.au. You can get a BONUS TruPURE when you order a TruHealth Bundle between 20 Dec 2017 – 31 Jan 2018. Order at mannatech.com (for all Automatic and One Time Orders). $250 to spend on Mannatech Products (issued as Bonus Loyalty Points to your Mannatech account) and $250 to spend on selected Mannatech Apparel, Merchandise or business tools at www.shopmannatechau.com. Winner is founded based on overall percentage lost across all measurements. See full Terms and Conditions. Purchase of a TruHEALTH Bundle between 20 Dec 2017 – 31 Jan 2018 will include a BONUS TruPURE. For Automatic and One-Time Orders.